Sometimes the easiest way is the best way to make a value sketch. It’s really important to have a value sketch before starting a painting. The sketch is like a road map to follow as you start any artwork. 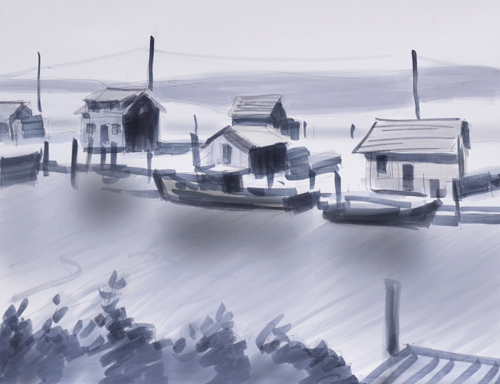 4 value sketch of a harbor scene with fishing shacks. PJ Cook. 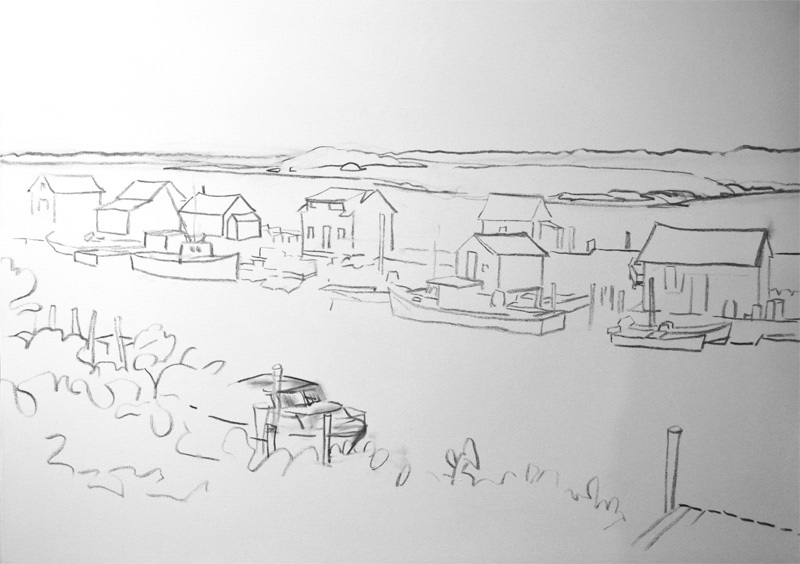 For the harbor scene above with the fishing shacks I quickly sketched the scene in pencil. Then using 3 grey markers I placed the values from light to dark. So this is a total of 4 values with white being the lightest value. Not only does this establish the light and dark areas of the painting but you begin to see if the overall pattern is interesting. Is there a nice variety of simplified shapes that link together? Does your eye move throughout the scene? Is the focal point evident. Are the value ranges correct? Avoid adding too much detail. Look at the large shapes and simplify them. If you practice this simple but effective step before opening tubes of paint I guarantee you will be a better painter. This one step has helped me tremendously to be a better artist. A grey marker sketch is an easy and the best way to make a value sketch. I will be using the value sketch from above when I complete this harbor scene from Martha’s Vineyard.